Definition at line 36 of file pit-out-record.hpp. Definition at line 31 of file pit-out-record.cpp. A nullptr return value means the Interest is still pending or has timed out. A non-null return value means the last outgoing Interest has been NACKed. Definition at line 48 of file pit-out-record.hpp. This is invoked in incoming NACK pipeline. An incoming NACK is accepted if its Nonce matches getLastNonce(). If accepted, nack.getHeader() will be copied, and any pointer previously returned by .getIncomingNack() . Definition at line 37 of file pit-out-record.cpp. 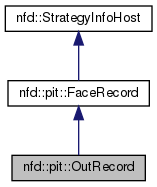 References ndn::lp::Nack::getHeader(), ndn::lp::Nack::getInterest(), nfd::pit::FaceRecord::getLastNonce(), and ndn::Interest::getNonce(). This is invoked in outgoing Interest pipeline. This invalidates any pointer previously returned by .getIncomingNack() . Definition at line 70 of file pit-out-record.hpp.